The fashion industry has a huge impact on the environment. Many of the clothes worn today are manufactured using synthetic materials such as nylon and polyester, made from petrochemicals which pollute the environment and cause global warming. Eco fashion relates to clothing manufactured using environmentally-friendly processes. While it includes organic clothing, eco fashion is not necessarily made from organic fibres. 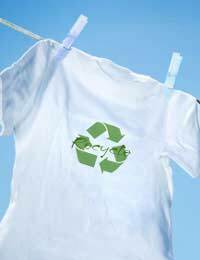 Eco-fashion clothing can use recycled clothing or recycled materials such as eco fleeces, made from recycled plastic bottles. As people become more environmentally aware, so the numbers demanding sustainable eco fashion have increased. Cosmopolitan, busy, funky and fashionable people who are ecologically-aware but do not want to sacrifice style for content are now being catered for by designers and retailers. It is now possible to walk down a high street and find even small companies who are adding eco-fashion and organic ranges. Eco fashion is no longer about hemp jerkins or homespun cardigans dyed with woad. Fashion designers, boutiques and clothing companies all over Europe are riding the wave of ethical, environmentally-friendly, sustainable products that account for £24billion of the UK market alone. The high street is becoming more ethical too, with Marks & Spencer, Topshop, Oasis and Tesco stocking organic clothing and Fairtrade collections. By 2007, 12 of the Oasis flagship stores stocked ethical designs made from 100 per cent organic denim and jersey, while Topshop stocked a variety of ethically-conscious labels, including People Tree, Hug, Made and Gossypium. Half a million tonnes of clothing is added to British landfill sites every year and many environmentally-aware people shun clothes made from synthetic materials that are non-biodegradable and so do not break down easily and are difficult to dispose of. There are other pollution problems associated with synthetic materials. For instance, during the manufacture of nylon, nitrous oxide – a greenhouse gas 310 times stronger than carbon dioxide – is released. Viscose, another artificial fibre, is made from wood pulp treated with toxic chemicals such as caustic soda and sulphuric acid. The production of natural fibres can harm the environment too. Cotton farming uses only one fortieth of the world’s cropping space but accounts for almost a quarter of global insecticide use. This equates to seven tablespoons of chemicals being used to make one cotton T-shirt. Cotton farmers exposed to dangerous pesticides every day can become ill and even die, while pesticides can affect local ecosystems, killing plants and animals and causing an imbalance. People wearing these clothes can be affected too, as the chemicals remain in the fabric and are released during the lifetime of the garments. Hazardous chemicals are used on wool, for example in sheep dips, and have been linked with illness amongst sheep farmers, while most polycotton and all easy care, crease resistant, permanent press cotton products are treated with formaldehyde, another toxic chemical. Certain dyes are believed to cause cancer. If garments are dyed or bleached using toxic chemicals without proper precautions, chemicals can affect workers and flow into sewers and rivers, damaging local ecosystems.